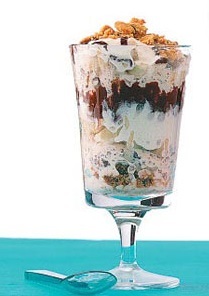 No Peels So... You Can't "Slip Up"
Banana Split Dessert Recipe from the kitchen of a real restaurant to yours: an effortless Banana Split Trifle; a customer tested and approved restaurant dessert recipe for your dining pleasure. Just sit back, relax and enjoy the praise! This restaurant dessert recipe uses quality, pre-made product so you can get it to the table quickly and easily. It's a real time-saver, but it is also a crowd-pleaser. Purchase the ingredients at your supermarket and spend 15 minutes "building it." Put it in the freezer and bring the dessert out shortly before serving. Enjoy the restaurant banana dessert recipe and the company of those you share it with! Did you know? 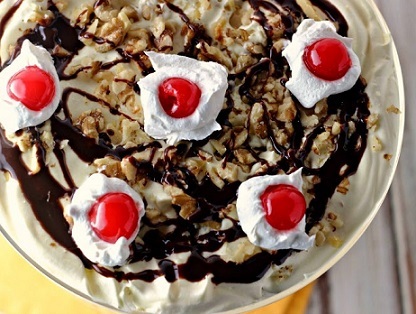 The banana split was invented in 1904 at Strickler's Drug Store in Pennsylvania.